In Nairobi, Kenya. December 2015. This one was busy taking seeds from the exotic weed Parthenium (Parthenium hysterophorus). 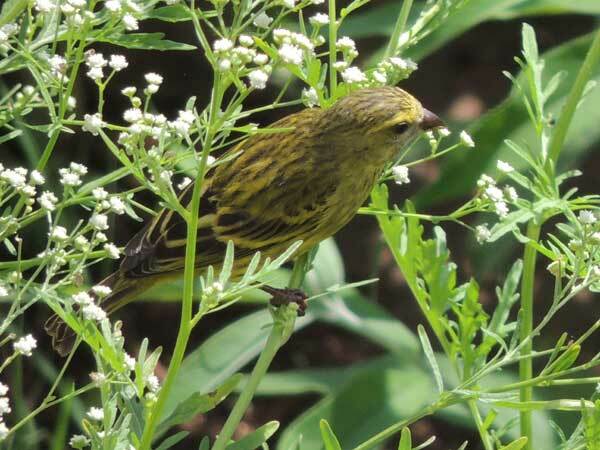 There are several similar canary species found in Kenya. They all plumage of yellow, greenish brown and black streaking on the back. The conical bill is adapted to feeding on seeds by cracking open the hulls. Females also have dark streaking on the chest. Copyright Michael J. Plagens, page created 2 June 2016.